Jehans Mikjelsson Haugen 1806-1872 g 1831 m Marit Sveinsdotter Gausåk frå gnr. 78/uplasserte 1807-1898. Marit selde garden og reiste til Stanton County, Nebraska med dei to yngste borna i 1873. It says that Jehans Mikjelsson Haugen (1806 - 1872) married (1831) Marit Sveinsdotter Gausak (1807 - 1898) and that she immigrated to Stanton County, Nebraska in 1873 (after he died). 1. Ågot f 1830, g 1854 m Knut Mikjelsson Håe. Dei var i Småbrøtin under Håe gnr. 84 til etter 1865, og flytte derifrå til Brattebrøtin gnr. 106/43. 2. Jehans f 1834, g 1862 m Marit Hallsteinsdotter Strand. Sjå Øydgarden gnr. 75/1. 3. Svein f 1837 d 1931, skreddar, g I 1860 m Jørand Olsdotter Rye frå Selseng gnr. 72/ 13, 1835-1865, død i barsel. 1 Jørand f 1865 på Lo. Svein Jehansson g II 1866 m Sigrid Ivarsdotter Øygarden frå Bergo gnr. 68/3, 1844-1912. It says that Sven then married (1866) Sigrid Ivarsdotter Oygarden (1844 -1912) from the farm Bergo. 1 Johan f 1866. I 1893 var han heimatt på besøk. Han var då farmar i Stanton, Nebraska, og skreiv seg Johan S. Johansen. I 1868 reiste dei til Amerika med begge borna og slo seg ned som farmar i Stanton, Nebraska. Der fekk dei fire born til. It says that John S. Johnson (1866 - 1893) immigrated in 1868 and later became a farmer in Stanton, Nebraska. Svein og døtrene Sarah og Ida var heime på besøk i 1914. Han skreiv seg då Sven Jonsen Haugen. It says that Sven traveled back to Norway in 1914 with daughters Saran and Ida. 4. Ola f 1841, død 1848. 5. Siri f 1844, g 1866 m Halvord Halvordsson Bergji frå Plassen gnr. 11/6 f 1829. Dei reiste til Amerika i 1868. Born: 1 Guri f 1866. 6. Berit f 1846, g 1867 m Erik Tomasson Strand. Sjå Dokke gnr. 65/4. 7. Ragnhild f 1848, reiste til Amerika i 1873. G 1873 m Ole O. Loe. Dei fekk seg homestead ei mil søraust for Stanton. 8. Ola f 1852, reiste til Amerika i 1873. G 1887 m Karen Lavina frå Newman Grove. Dei budde ei stutt tid i Stanton County før dei flytte til ein farm nær Newman Grove. This page will include the family of Berit Johannesdtr Haugen, sister to Sven Johnson and aunt to Iver Johnson. The researcher for this information is Sigbjorn Kullhuset. The picture below is of Berit and Erik Dokken. It was provided by Sigbjorn Kullhuset. The following letter is from Statsarkivet i Hamar dated September 25, 1990 addressed to and provided by Paul Johnson. Erik Tomasen Strand, ag 22, and Berit Johannesdatter Midstrand, age 19, ,married January 27, 1867. His father was Tomas Eriksen, her father was Johannes Mikelsen (Nord-Aurdal parish register 1863-1875, page 253, no.5). The following letter is from Ester Olstad dated November 8, 1990 addressed to and provided by Paul Johnson. …I have found one more (child): Tomas, born May 20, 1878. In 1900 (the national Census). Berit and Erik lived at Dokken (that was a part of the mainfarn Sor-Strand) together with the two sons Johan, a shoemaker, and Ole, a schoolboy. Erik Tomassen Dokken, born in 1845, died 1917, Sept. 9th. He was then said to be a widower, and that he left 4 children: Tomas Dokken, Johan Dokken, Ole Dokken and Marit Dokken. …Tomas Dokken died as a widower in 1956. His wife’s name was Sigrid. They had no children. 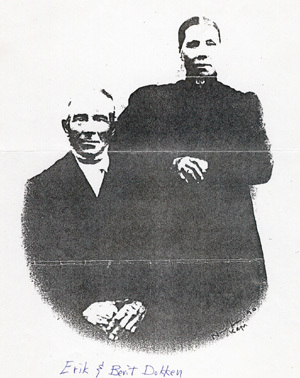 The inheritors were given as follows: Brother, Ole E. Dokken, Oystre Slidre; Sister, Marit Hyllene (died before 1956). She had these children: Halvor Dokken and Gudrun Dokken (b. 1918). Gudrun seems today to live at Fagernes in Nord-Aurdal. Her name is Gudrun Kulhuset. The following is a letter dated December 11, 1990 from Gudrun Kullhuset to Paul Johnson provide by him. It was translated by Torunn Stromme. Thank you very much for the greeting I got through Torunn Stromme. It was so nice to hear from you. Torunn told me that you spent the night in Fagerness this summer, and the strange thing is that you were only some hundred meters from where I live! 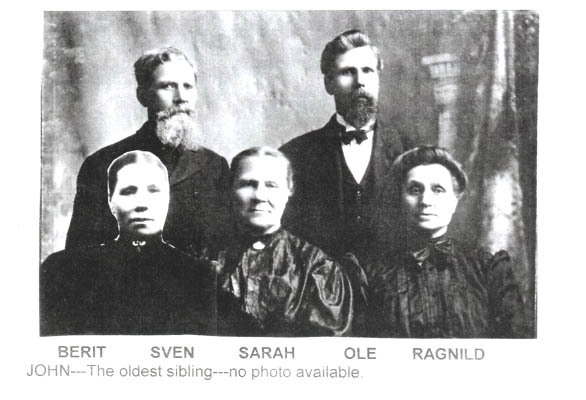 I knew that my mother had more cousins in America: Sven, Ole, Siri, and Ragnhild immigrated. Only my grandmother stayed in Norway. My mother, Marit Eriksen Dokken was born the 13th of November 1883, she died in 1948. She told me that her uncle Sven and his children were home back in Norway once, but that was before I was born. My mother had a boy born the 21st of October 1910. she wasn’t married to the boy’s father. She married my father later, and I was their only child. I was born the 14th of December 1916. My half brother started working at the printing office of the newspaper “Valdres” as a typographer. He had very good skills and the last 20 years of this career he was director of this newspaper. He had an accident (he was driven over by a car) and he died of the injuries in January 1979. He worked at the same place for over 50 years. I married Martin Kullhuset from Aurdal in 1935. We lived home by my parents until 1938. Then we took over the farm where my husband was born. We have five children. In 1954 I became a widow because my husband was killed in a car accident. These years were pretty hard because of sorrow and hard work. Our oldest daughter was 19 years and our youngest one was 8 years old when that happened. Fortunately things turned out well. The children were healthy and they learned to be helpful. They are now married and have their own children. They are 55 – 53 – 51 – 49 and 44 years old now. All of them live in the community of Nord Aural. When the children were grown-ups and got married, I moved to Fagerness. I grew up on a little farm 3 kilometers from Fagernes. Now I am renting a little apartment in the center of Fagernes. I’m doing fine, and I must admit that I didn’t think my life as an old person would turn out as nice as it has. My health is OK too, I do have some tiny bothers but that is normal at this age. My mother had three brothers. They were Thomas, Johan and Ole. Thomas married and he and his wife and Johan went to Nebraska in America. Thomas and his wife lived there for 6 years and then they moved back to Norway. Johan settled down there and married a Norwegian born woman and they had five children. He was a shoemaker and had his own store over there. Unfortunately I haven’t had any contact with them. One of Johan’s daughters was here in Fagernes years ago; she was with a travel company. I didn’t get to meet her but my half brother did. It was mainly my uncle Thomas that we kept in touch with writing letters to each other. When I was a little girl Sarah Midtlien came to visit. I think she was Sven’s daughter. She was married to a priest called Midtlien. They didn’t have any children. He also had Norwegian ancestors and he came to visit. My mother’s youngest brother, Ole, settled down in Oystre Slidre (a neighbor community of Nord Aurdal). He and his wife died years ago and many of their children are died too. My grandmother, Berit, died in 1909 and my grandfather died in 1917. They are buried in Strand church (Svenes). My grandparents on my father’s side and my parents are buried there too. I have 12 grandchildren and even great grandchildren. One of my grandchildren, a girl 15 years old would like to write to one of your grandchildren if you have one about the same age as her? The language id difficult for me. I have some children who can translate from English to Norwegian though. This is it for now, I tried to write about what I thought might interest you. I hope we can find something out about our roots after having some contact by writing letters. I wish you and your family a merry Christmas and a happy new year!